What better way to warm up during the cold winter months than with a quilt? 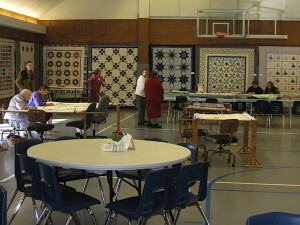 The first Quilting Workshop was held in 1973. It was started because of a renewed interest in quilts and quilt making. At that time, there were few quilting classes available but many people eager to learn. Zion was in a unique position to share quilting skills, as a long-standing quilting group met regularly, and continues to do so today. 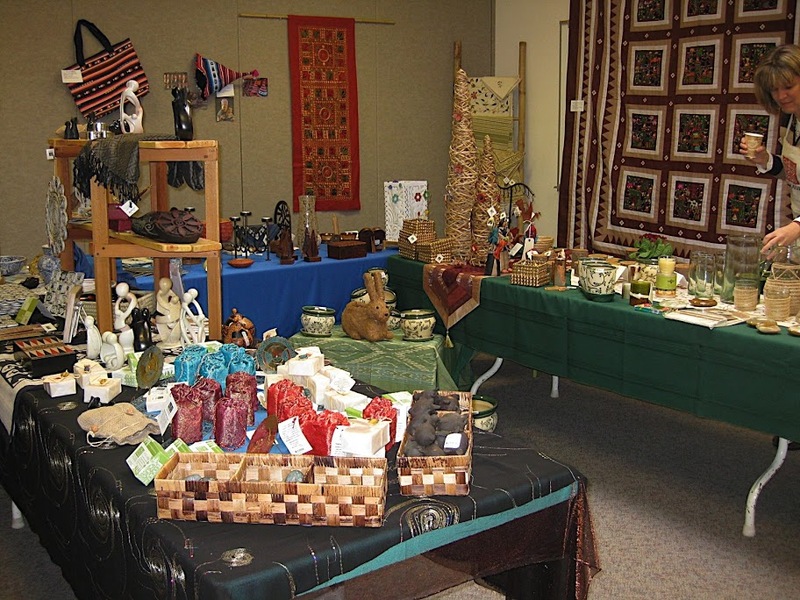 The three-day workshop includes display of over 100 quilts, wall hangings, and comforters ranging from the latest techniques and colors to century old heirlooms. Workshop volunteers guide guests through every step in the quilt making process. A “learner’s quilt” is available for anyone who would like to sit down with an experienced quilter and try their hand at stitching. In addition to the quilt display, guests are drawn to the Workshop for the homemade soup, bread and lunch. 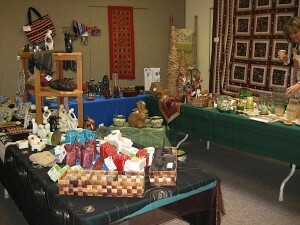 Many participants appreciate the opportunity to shop for ‘Fair Trade‘ items at the “One Fair World” shop set up onsite especially for this event. Up to 1000 visitors attend each year, please make plans to be part of the tradition! In 1973 we never would have guessed that 33 years later we would still be giving a workshop on quilting at Zion. Women have been quilting at Zion ever since the church began and had become known for their skill and willingness to quilt for others. In the early 1970’s requests came to have quilting demonstrations at the Ox Barn Museum in Aurora and at Meier and Frank Department Store in Portland. At these events people had so many questions about patterns, fabric, needles, frames, instructions and all the things that go into making a quilt and there was little information available in the fabric stores. Talking about the needs of beginning quilters and hoping younger women at Zion would learn to quilt were the impetus for having some kind of quilting event. Lilly Berkey, then Women’s Missionary and Service Commission president, received enthusiastic commitment from the entire group to work on such an event. The guiding principle was to share freely their expertise. There would be no fees and there would be no quilts for sale. Quilts would be on display but the main emphasis was to demonstrate the various steps of quilt making. The first workshop, held for three days the third week of January, brought 108 guests. That was enough attendance to try a second year and then more. People were so pleased to find a place they could learn about the whole process of quilt making and some would come all three days and come back each year. But there were always a lot of new people each year too. By the fourth year 600 people came and on the tenth year, 1206. One year it was publicized in the Sunset magazine and 2000 guests went through our cramped basement. Publicity encouraged bringing a sack lunch, but a few sandwiches were made for those who hadn’t intended to stay so long and by the thirteenth year soup was added. Along with sharing knowledge of a craft there was concern that visitors could learn more about who Mennonites are. A brochure was given to each person with a brief history of the Mennonite Church, her beliefs and mission, and information about our services, and a corner lounge area was set up with literature and books. Guests were very thankful for what they received and wanted to a way to express their gratitude for the friendly and practical advice they were given so donations were accepted for a Mennonite Central Committee (MCC) project. In 1984 it seemed appropriate to add a Self-Help Store (now Ten Thousand Villages). It was very well received. Let’s look what’s happened more recently. We now have the workshop at the end of February. 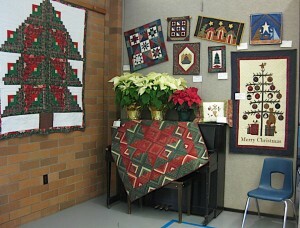 We have a beautiful large fellowship hall and foyer we decorate with quilts every year. We have the Ten Thousand Villages store in an adjacent classroom and we serve homemade soup, bread and dessert for lunch. This year we had 1250 visitors, served 900 bowls of soup, $3600 was given in donations to MCC (this years project was designated for Sudan) and the Ten Thousand Villages store sold just under $4600 worth of merchandise. New this year was a table with brochures, bookmarks, buttons, posters and books about peacemaking which was well received. The question for 33 years now has been, “Shall we do it again?” . We had thought the interest might last 5-10 years, but it has just grown. And even with all the wonderful quilt fabric stores now and the classes they give, we have lately averaged approximately 1000 visitors during the three days each year. Through the Quilting Workshop we have shared not only the skills and techniques we have learned, but the needs of people around the world, by the various MCC projects we have highlighted for donations and by increasing the awareness of fairly traded goods. We are not in this effort for what we can get out of it, but as a service to others. With over twenty thousand people having come through our doors we hope we have given them not only beautiful quilts to look at, good advice and help and good food, but inspiration to share whatever they can with anyone in need.